Students of the University of the Fraser Valley in Chilliwack will soon be learning in state-of-the-art surroundings at the university’s Canada Education Park campus, thanks to pre-construction infrastructure improvements. Local politicians and Advanced Education Minister Naomi Yamamoto got a sneak peek at the new building on Tuesday, Nov 8. Mark Strahl, MP for Chilliwack–Fraser Canyon, Naomi Yamamoto, Minister of Advanced Education, and Barry Penner, MLA for Chilliwack-Hope, joined executive, faculty, staff and students to celebrate completion of a site preparation project that has paved the way for construction of UFV’s new Canada Education Park campus. UFV has received funding approval in the amount of $7.2 million from the provincial and federal governments for this pre-construction project through the Knowledge Infrastructure Program, part of both governments’ commitment to repair and expand research and educational facilities at post-secondary institutions. This was among 39 projects at post-secondary institutions throughout the province that were part of the Knowledge Infrastructure Program, a joint federal-provincial investment designed to renew infrastructure at post-secondary institutions across B.C. while also providing local jobs for communities. UFV’s new campus is being constructed on land formerly occupied by Canadian Forces Base Chilliwack. 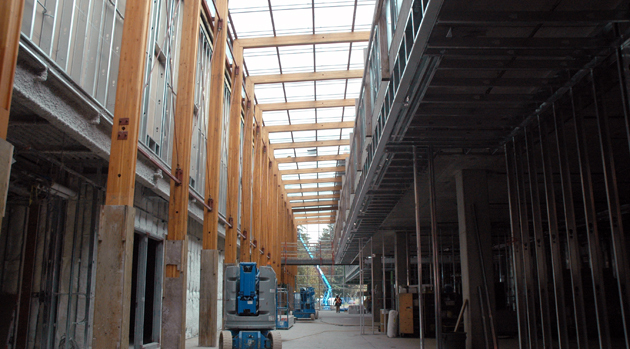 Structures will be constructed following the Wood First Initiative, and are expected to meet LEED Gold standards. The new campus is expected to be completed by May 2012.